Pessimism leads you nowhere and should be shunned summarily. The world is full of opportunities and we are given all the tools to make the best use of them. Pessimism has no place here. “Pessimist is one who when he has the choice of two evils, chooses both” said Sir Oscar Wilde. Pessimism will ultimately lead to failure, sorrow and burden while optimism takes you through all hurdles and obstacles to the path of glory. Kahlil Gibran poetically says, “The optimist sees the rose and not its thorns the pessimist stares at the thorns oblivious to the rose “. The world is full of roses, why look at the thorns? “Pessimism drops the curtain on tomorrow “says Robert schuller. In fact there is no tomorrow for a pessimist while an optimist makes tomorrow even on the last day on earth. 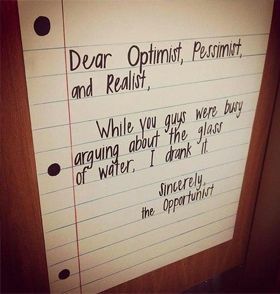 Read these quotes on pessimist and be an optimist by sharing these quotes with others.